A first hand look at Playstation's side scrolling skater of the century. 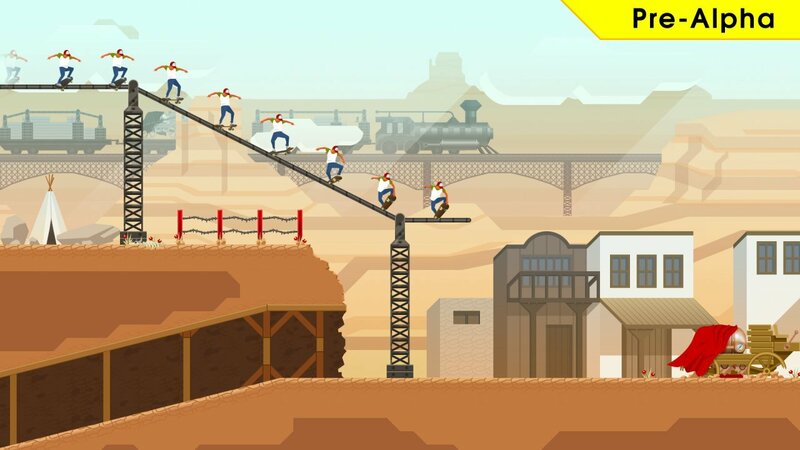 Recently announced at EGX, OlliOlli‘s second iteration is risky, even for the brave devs at Roll7. 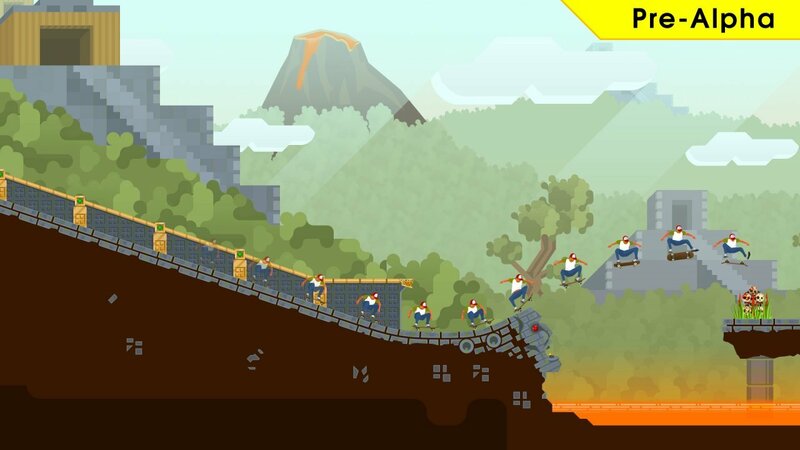 OlliOlli 2: Welcome to Olliwood — to give it its full, more pun based, name – has received plenty of gameplay changing additions, a handful of new modes and a complete rebuild of some of the elements that were specifically praised by critics in the first game. There’s a lot that could go wrong with OlliOlli 2, but then who’d have thought we needed a handheld, 2D, side-scrolling skateboard ’em up in the first place? The most immediately recognisable change made to OlliOlli 2 is its visuals. The original’s 16-bit graphics did a superb job of representing hardflips and nose-slides with a mix of broad, muted visual strokes and highly accurate animations. The effect was impressive, but the trouble, say the developers, is that no one was really paying attention. Time for a change then. OlliOlli 2 does away with the pixels and replaces them with a more cartoony style built around Sony’s proprietary PhyreEngine which maintains OlliOlli’s simplicity while creating a smoother, more defined experience. It’s a noticeable change: the skater dude’s T-shirt lifts as he lands from a great height, every movement of the board is crystal clear and tricks are much more easily discernible from one another. Even without the new tricks (we’re getting to them, I promise), Roll7 says the number of animation frames has almost doubled from the first game. The most notable change to the trick system is the inclusion of manuals which, skill allowing, widen the possibility for truly massive combos. For those who remember the mechanics of the first game, the manual system works almost identically to the system for grinding: Instead of landing perfectly at the end of each combo, with a well timed tap of the X button, players are able to continue their combo with an over hyped wheelie by tugging at the left joystick and simultaneously hammering X just before landing. As with grinding, there’s no balance system a la Tony Hawk’s Pro Skater. Instead, the risk reward system equates to the ability to successfully maintain speed over terrain. Slowing to a stop while manualing will result in a premature trip to terra firma, thus ending your combo and keeping the leaderboard forever out of your reach. For me, the lack of manuals was one of the features of OlliOlli that differentiated it from the other skating games on the market. It’s strange to talk about realism in a game where you frequently grind from nuclear missiles to Russian helicopters, but the gratifying landing system effectively recreated some of the satisfaction of actually landing an ill advised leap down a set of stairs. Pressing the X button at the end of each combo in Olliolli effectively “banks” those tricks in your combo and as a result, it made for an incredibly satisfying experience. To make matters a little more tricky, level terrain is now a fair bit more curvy than the strictly horizontal routes in Olliolli. Apart from providing additional velocity and jump off points (for totally radical air brah!..Ahem), curvey terrain will hopefully add some dynamism to maintaining speed, thus amping up its difficulty and making the prospect of finishing a run prematurely all the more appealing. The grind system itself has also been refined somewhat with the addition of grind switching. This new technique allows players who’re able to grab those often elusive “perfects” the option of switching grinds without leaving the rail in order to add one more trick to their combo counter. It’s a small change, but being able to turn a 50-50 into a boardslide at a moments notice adds yet another layer to an already deep set of tricks. Both new trick systems reward skills picked up in the first game – perfect landings and lightning fast judgement in particular — so although OlliOlli fans will have a few new moves to familiarize themselves with, they’ll still be leagues ahead of those starting from square one. Moreover, the mechanics of flipping and spinning are almost identical to the original so those with twisted thumbs from the first game will likely find their muscle memory comes in very handy indeed. The name, in case you hadn’t guessed, refers to the game’s new movie based theme. Along with it comes narrative, a new addition to the score based franchise, and it’s coming in the form of a loose justification for transporting the skater dude from one ludicrous set to another. Expect Aztec, Wild West and L.A based levels to replace the USSR and Neon Tokyo locations from the first game. Currently, OlliOlli‘s charm is in its fast paced, skate-fall-repeat gameplay, so it’s not unreasonable to be wary of anything that might threaten that rhythm. It’s a common theme for games hoping to expand on their initial premise however, and at the very least Roll7 seem to have enough of an understanding of the game to keep insignificant plot points from getting in the way of compelling gameplay. The final revelation from the chaps at Roll7 is the inclusion of new, local multiplayer mode “Combo Rush.” Matches involving up to four players can be set up based on either time, or target high scores, but they essentially maintain the main game’s combo chasing gameplay. Multiplayer may seem like a bit of an insignificant announcement in a climate where every game and its virtual dog has a multiplayer mode of some kind. However, considering that the original Vita release didn’t even include online leaderboards, local multiplayer may add significant replay value to an already compulsively replayable game. It’ll also be interesting to see if the addition of multiplayer will force players into new tactics, as ending combos early could affect players’ place on the end of match leaderboards, thus determining who will walk away with those all important bragging rights. Compatibility with the Playstation 4’s much touted Share Play may also mean that local matches aren’t so local after all. The vague 2015 release date means that the developers are probably a fair few pushes away from a full frontal face plant into “Crunch time.” The pre-alpha code at EGX was visually uneven to say the least but I’m already excited to get my hands OlliOlli 2: Welcome to Olliwood. OlliOlli took certain parts of the gaming community by storm, but some buggy moments and occasionally uneven levels demoted it to an existence as a refreshing, but imperfect twitch classic. New features and a revitalized art style, are intriguing but if OlliOlli 2 is a refinement on its predecessor, I’m on board (sorry). OlliOlli 2: Welcome to Olliwood is due to be released sometime in 2015 for Playstation 4 and Playstation Vita.